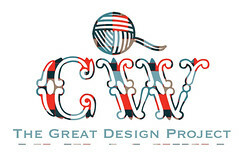 As most of you know, I completed another design for Cascade Yarns a few months ago and I've been eagerly stalking their site for it's release. I'm excited to say that my Heritage Silk Lace Mittens are now available for download on Ravelry, or directly from Cascade's website. They did another wonderful job with the photos and I'm really excited to finally share the pattern with you! 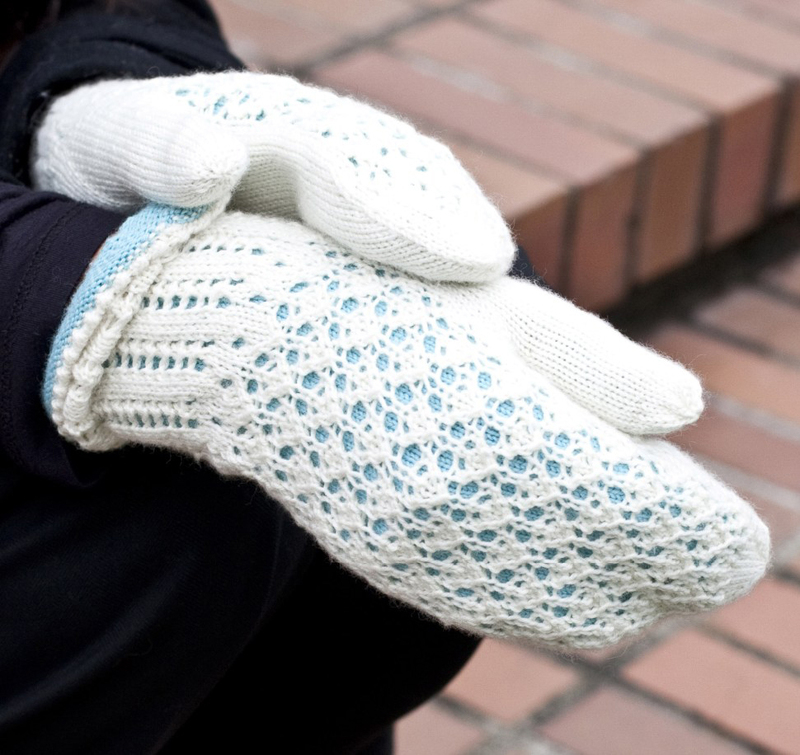 The mittens are two-layered, with anatomical thumb placement to keep the pretty lace design on the back of your hand (where it belongs). 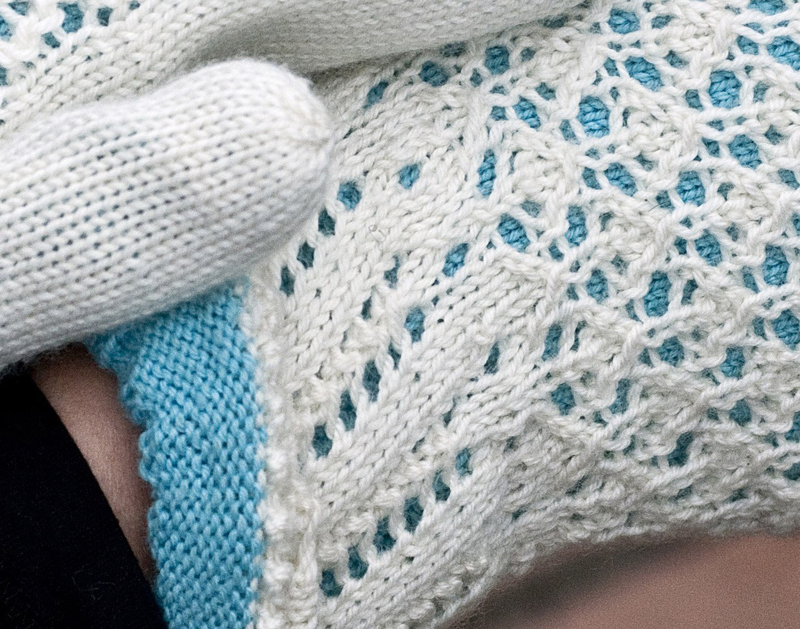 The inner mitten is worked at a smaller gauge and has ribbing at the cuff, to help keep the wind and cold out. The pattern suggests that you "pick-up and knit" when starting the outer cuff, but if you would rather use a provisional cast on to do this step, feel free (just remember to do that when you start the inner mitten). The outer mitten has a picot edge, a lace cuff, and eyelet holes at the wrist for an optional ribbon if you really want to girl these up. The lace pattern is worked over a small number of stitches and rows, and was easy to memorize after a little while. The pattern is written for three sizes, S (7" - 7.5"), M (8" - 8.5"), and L (9" - 9'5") in circumference, and includes written and charted direction for the lace (on the last page, so you don't have to print them if you don't use them). 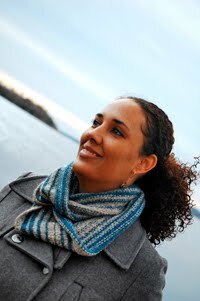 You can use any colors you like, but the design shows best if you choose yarns with high contrast. I would also advise that if you substitute yarns, make sure that they are both colorfast as these mittens are attached. Those are so pretty. I never had the patience to knit. Kiddos to you. Cam, these are gorgeous!! What a great and beautiful idea.